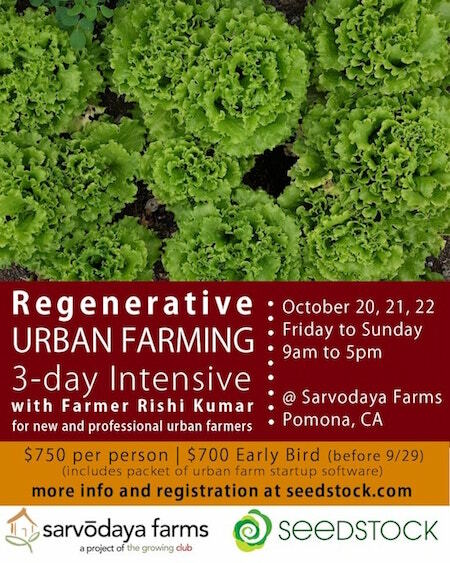 The Growing Club / Sarvodaya Farms and Seedstock are offering an intimate 3-day Regenerative Urban Farming Intensive workshop in Southern California for professionals on October 20, 21, 22 (Fri-Sun). Only 10 spots are available for the workshop, which is aimed at urban farming professionals who are working towards starting a commercial urban farm as a private for-profit or non-profit business. The goal of the workshop will be to provide a base of relevant knowledge, basic skills, and local resources to start and operate a regenerative soil-based small-scale or urban farm. Workshop will include both hands-on and lecture portions on the Sarvodaya Farms property where attendees will be able to see, experience, and participate in a working regenerative urban farm. The workshop is divided into 6 sessions over 3 days: morning and afternoon for Friday, Saturday, and Sunday. The workshop will be led primarily by Sarvodaya Farms founding farmer & director of The Growing Club, Rishi Kumar, with additional sessions led by Manju Kumar (Sarvodaya Farm’s Field Manager) and Lynn Fang (Sarvodaya Farm’s Compost Manager).